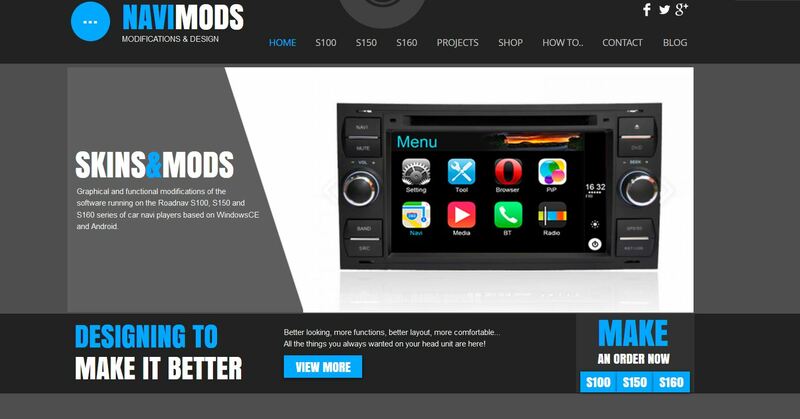 KoTiX -Tech & Mods: NEW SITE!! New S160 rooted ROM! NEW SITE!! New S160 rooted ROM! The site is still under developement but it's already functional and you can see all the pictures and videos of the S100 skins and Android roms. I'll add all the infos and guides that the user need to use my mods and to improve the experience with the Roadnav units. In case somebody need more assistance, there is the possibility to contact me directly from the site. This is my very first internet site so don't expect that everything is perfect. I'll probably change the domain from .tk to .com in the future but right now i want to be sure that i going in the right direction. This is not the only big news today! I also have completed the first release of my S160 ROM! Check out in the S160 section of the site all the images, the video and the features of it . If you would like to buy it simply go in the proper SHOP section and hit the BuyNow button. UPDATE: an important fix for the S160 ROM is available! I strongly recommend everybody is using my S160 ROM to download the new version 25.02.2016 and flash it again. Hi KoTiX, congrats, on the site, looks great! One question if I may, on the S100 modding. If I want to add a "call-to-action" button somewhere on the screen, let's say to take me from radio straight to audio player, how can I do this? I see in the XML files, that there are some IDs, which probably lead to these functions, but how do I know which ID is which? Hi Roman,unfortunately the s100 software is not so flexible to do everything we like. Many things are hardcoded in the executable and cannot be changed unless you are able to do reverse engineering. Even if there are ids for the screen, there is not a "jump to screen" function. I wish there was too. thanks for replying...I think maybe I didn't make my intentions clear...I know that the S100 is not so flexible as Android, but I believe that there must be some space left to do small modifications - your skinpack is the perfect example. What I would like to achieve here is, to get some "list" of the IDs for specific functions. In the little free time I have left, I'm trying to update the iPod functionality, so I'm able to browse through the content on the device. When I look at the graphics in the firmware file, there are icons there, which should navigate the user through the iPod, but I can't "call" this functionality - I don't know the ID of this sub-menu. Or even the IDs of the buttons themselves in this sub-menu. You say that many things are directly in the exe - are we talking about the Platform.exe file here? Or is there another executable that handles the device? I might be able to let a friend look at the exe, I just want to know where to look, so I don't waste (his) time. Or, perhaps, if you know how to get to the IDs of some functions, other than those in the XMLs, it would be great to share...we can talk via email if you prefer - roman [at] kolinek [dot] sk. Everything is coded in the platform.exe and sqlite.dll except the audio,video player and dvr that are separated exe. IDs are specified in the XML files only, there is not a list and each screen use its own IDs. It mean that you cannot use an ID from a screen into another screen, it will not do anything. You can try yourself with the EXEBUTTONS in the games section: they work just there and not in other screens. I know it's a pain... this is why almost nobody work on this platform. Anyway , better if we talk by email about this. ciao kotix posso chiederti che telefono hai collegato nell's160? perche il mio galaxy s4 non ne vuole sapere di connettersi con la radio... nella tua rom hai modificato qualche cosa del bluetooth? Ciao Omar, io uso il oneplus one e non ho modificato nulla. ciao grazie per la risposta... per caso sai quale potrebbe essere il problema? perche il galaxy s3 si collega senza problemi, mentre il galaxy s4 no.. il problema non credo sia lollipop perche ho fatto anche il downgrade a kitkat ma non funziona lo stesso... ho provato a collegare il mio tab 4 con lollipop e si collega senza problemi.. ho provato anche un htc con lollipop e si collega... so di persone con il nexus che non si collega con bluetooth... ci potrebbe essere qualche driver aggiornato? Ci deve pensare il produttore a questo. Cmq provo a vedere se trovo qualcosa a riguardo. good idea Marco :-) however it seems that we will loose ability to write and view comments about your products. I find useful read all comments/questions and most of all your replies before going public and asking something. Many things become clear reading whole stuff below article. This blog will remain and a small blog there will be on the site too. I'm sorry man but that skin is far to be released. Maybe before summer.. I'm busy with s160 and I can't work on s100 now. So if you want to proceed buying carplay skin, you can do it right now and install other skins in the future whenever you decide. I just purchased your ROM for my S160 and I have not received the file. What gives??? Si certo, vai sul mio sito, sez shop. Hi KoTix, anyway to be able to rip music cds to an external folder? Hi, you need to buy the conversion software and if you wish my ROM too. La actualización de s160, 12 de agosto conserva el bootmation original o es el tuyo? Y si lleva el tuyo como podría poner el original me gusta más. Utilization la mi bootanimation porque el tiempo de boot es inferior de 5 segundo. La rom s150 tiene screen mirroring?? Hi I have just brought the S160 rom where do I get the download link ? Thanks. wie kann ich den dalvik cache löschen? Ich habe nur einen Touchscreen zum bedienen. Hi, I paid for the S160 yesterday. Can you Send me the download link pls?